In Iceland you can never trust the weather and you have to be prepared for just about everything. 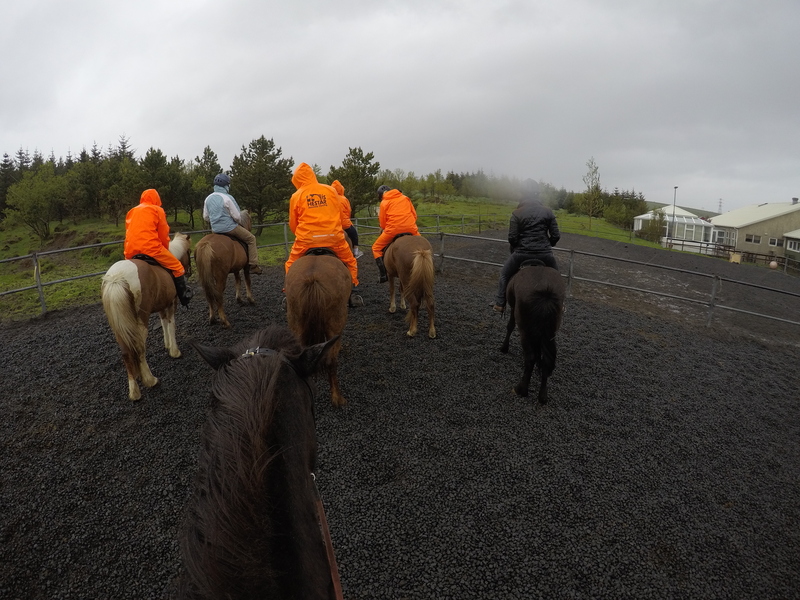 That’s how we ended up looking like this on our afternoon Icelandic horse riding adventure. It likely tied for the worst day of weather that we had during a full month spent in Iceland, but was still a pretty fun experience! The day started out with a pick-up from a hotel nearby to our Airbnb (they couldn’t pick up at Airbnbs or local homes, at the time of our tour anyway). It didn’t take us long to get to the barn where we were instructed on some safety concerns and had the opportunity to pull on some optional rain gear. With the weather as it was, rain gear was hardly optional! From there the group was separated into beginner riders, intermediate riders, and experienced riders. Horses were chosen for each rider accordingly. I used to ride horses a lot when I was younger, but haven’t much in recent years so I self-identified as an intermediate rider. About half way through the ride we got to a break point that shielded us from the wind and the rain. The horses were allowed to chill and eat for a few minutes. 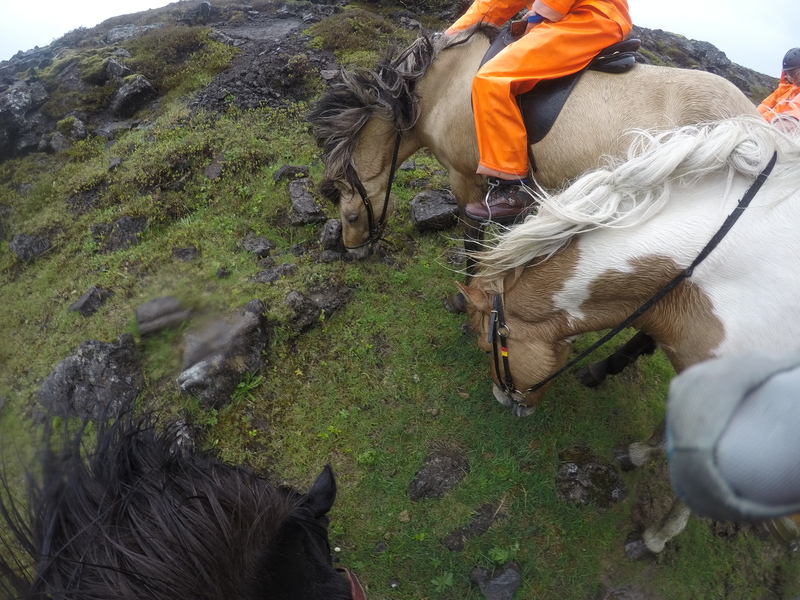 Everyone was pretty excited to be past the half way mark of the ride considering the wind and the rain — it felt like a true Icelandic experience! We returned to the barn, gave our horses back, took off our rain gear, and went inside to enjoy some complimentary warm cocoa, tea, and coffee. I got to admit. After doing more than a few trail rides out here in Colorado I’m kind of done at about the 20 minute mark. 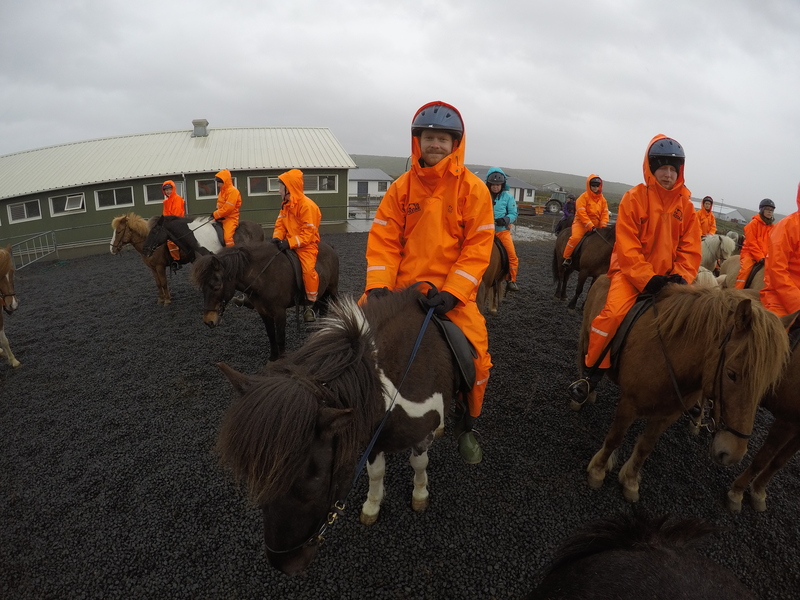 Maybe it’s because we’ve signed up and as luck would have it, on the day of our ride had weather somewhat similar to what you experienced in Iceland. A month in Iceland….wow, that’s a pretty extended stay. Horses definitely aren’t the most comfortable! I think we were riding for around an hour… maybe a little longer? Yeah a month in Iceland was great! A little too expensive for my normal travel budget, but such a beautiful country!